If motivation is even slightly a problem, then a pre-workout energy drink is a great solution and gives you that needed boost. But most of these drinks are designed for men looking to pack on muscle. So what about women? We answered. Our energy drink brings superior ingredients, beta-alanine, natural amino acids like glycine and taurine, all backed up by the fat-burning power of l-carnitine and Advantra Z®. This is FitMiss Ignite™. Designed to support converting fat into energy, improving endurance, promoting healthy body composition! Recent studies show Advantra Z® increases food’s thermal effect, especially in women. After decades of research, Advantra Z® changes the way your body metabolizes fat. 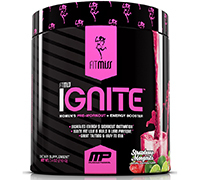 FitMIss Ignite uses patented CarnoSyn® beta-alanine for best-in-category quality and superior results. As a dietary supplement, mix 1 stick-pack or 1 scoop of FitMiss Ignite™ in 14-16 oz (415-475 ml) of water, 20-30 minutes before exercise. For best results, drink a minimum of 3.80 Liter (1 gallon) of water daily.